Yes everyone, I’m alive. I know it’s been awhile since I’ve posted but I figured I lead into this month of February with a red soup. 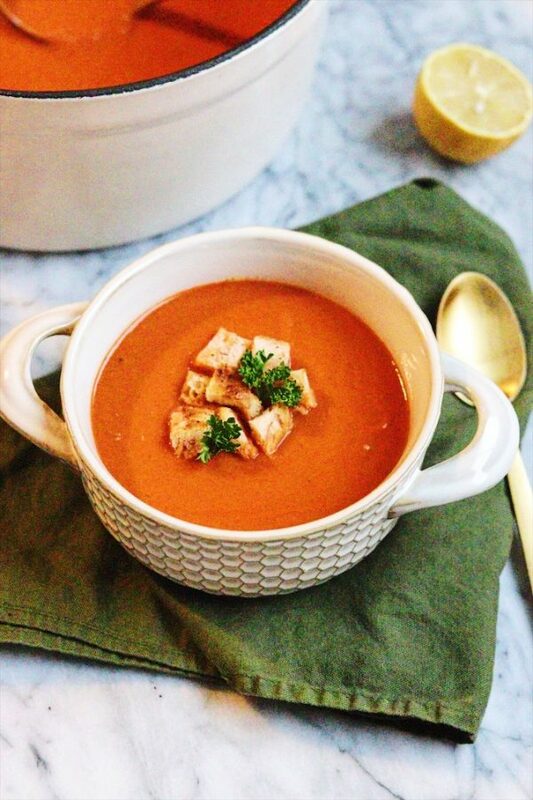 This Easy Tomato Soup is everything it says it is–easy and tomato-y. Let’s get straight into it. Well, we are more than half way through winter, thankfully, and flu season is entirely underway. My husband has been sick since Saturday and praise everything that is holy that I made this Sunday and he has eaten it the last 2 days. That’s about all he has eaten. In case you’re wondering, it feels good on a completely raw throat…..I’ve been told. If he’s eating this when he is miserable, I imagine it means that it’s even that much more delicious when he is not? We will roll with that idea. 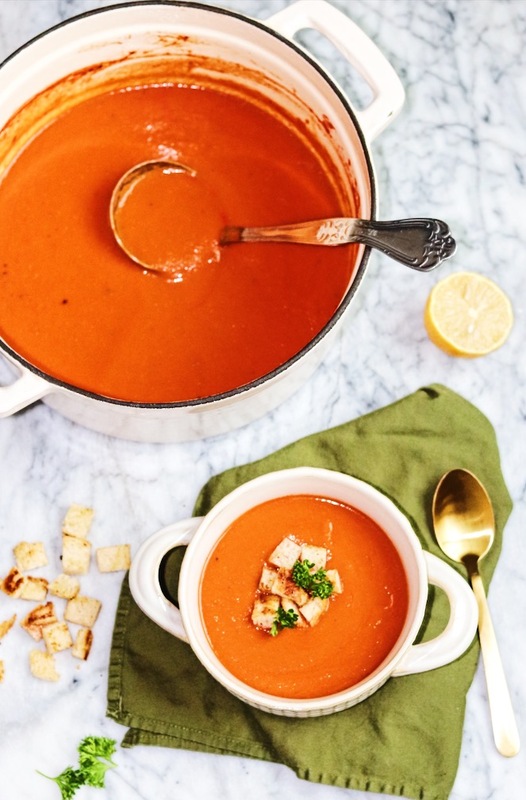 This delicious tomato soup has 9 ingredients, is extremely hands off once the vegetables are chopped and is made in one pot, although, aren’t they all? Whatever, it sounds good, right? 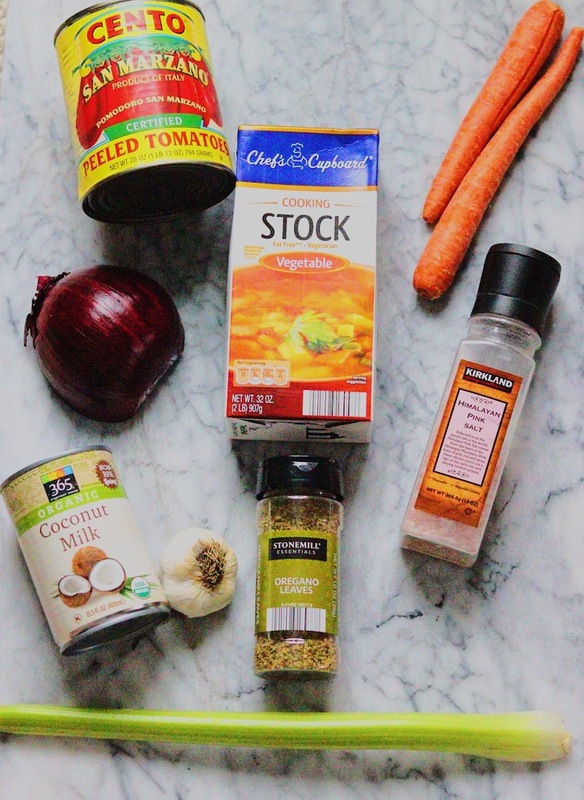 The short and skinny of this recipe is chop the ingredients, throw 3 veggies into a pot for them to soften, add the oregano, garlic, and tomatoes, then cover and simmer. Add more liquid, puree, and voila! Yes, it’s that easy. So easy that I even used the word easy in the title. Clever, eh? I did find that I enjoyed this recipe more with coconut milk– the full fat, canned coconut milk. I used almond milk the second time I made it and it wasn’t as delicious as the first. Anyway, make this bad boy before the weather turns warm. If you’re reading this in Indiana, you’ve got until about May. I think that’s enough time. As always, let me know what you think by leaving a comment below and rating the recipe. Also be sure to tag me on Instagram and Facebook @plantiful_grub so I can see your creations. It’s good to be back, friends. Until next time. Quick and easy to throw together. Quality, canned, whole-peeled, tomatoes are important in this recipe. Letting them simmer with the other vegetables for 15 minutes, or longer if you have the time is also important to get the delicious flavor. To start, heat a heavy bottomed pot on the stove to medium heat and add the olive oil. While the pot is heating up, chop the carrots, onion, celery, and garlic cloves. Once the pot is warm, add the onion, carrot, and celery and salt to the pot. Cook that down over medium heat until the onion is translucent. Next, add the oregano and garlic cloves. Continue cooking until the garlic is just fragrant, about 1 minute. Now add the can of good quality San Marzano whole- peeled tomatoes. The quality of tomatoes is crucial here to get an excellent flavor. Stir the pot to make sure everything is combined, cover and reduce to medium-low and simmer for about 15 minutes. At the end of 15 minutes, everything in the soup should be completely cooked through. You will notice more liquid in the pan from the steam catching on the lid and then falling back into the pot. This is a good thing. To the pot add the coconut milk and the vegetable broth. Stir to combine and then add to the blender for pureeing. If you must do this in batches, that is okay. Something to note about blending hot liquids---the pressure can cause the top to blow off and hot ingredients to go everywhere. Be very careful! If you have a high speed blender with a lid that breathes, that is the best option. If not, feel free to let the soup cool a bit. Once pureed, return to the pot and warm through before serving. Taste for salt and feel free to toast some bread cubes as a topping. A squeeze of lemon at the end over individual bowls really makes this soup sing.